This is a good ad. I would like to spice up my rooms with some of their fabrics. Sunbrella fabrics are great! Not only do they make beautiful durable fabrics, they also have an 8 year manufacturers warranty on their fabrics so you know your investing in something that is going to last. 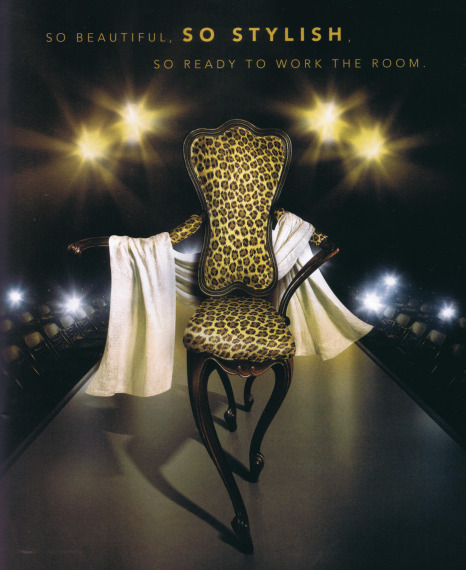 We love this leopard sunbrella fabric on this chair. May we order? We don’t sell this fabric unfortunately! This is just a presentation, you might need to find out a store near your area that carries them. If I find the particular fabric on line I will let you know. I don’t know where you can buy it on line. These fabrics are usually available in fabric or design stores.